From welding and Automotive, to Photography and Audio Video courses, there are classes for every possible interest. Students from the Human Growth and Development course were demonstrating the babies that students carry with them to give a real life example of what parenthood is like. Photography students were taking pictures of attendees in their Photo Booth, set up for the event replete with props and a glittering backdrop. 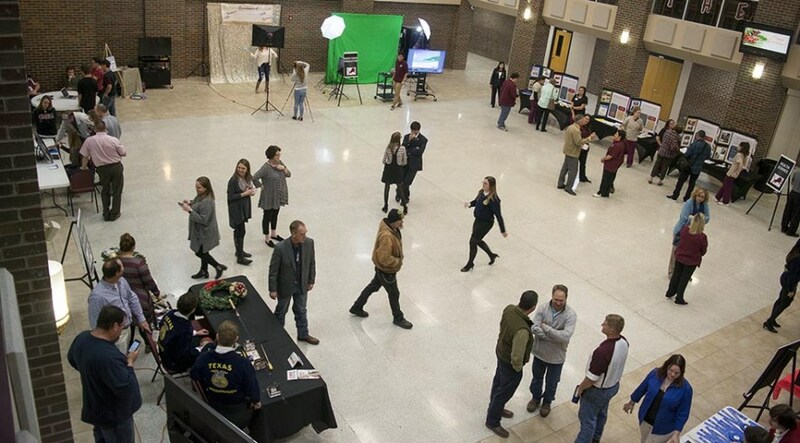 FFA students showcased their skills in a variety of things, from crafts and decorating to repairing a broken fishing rod. Construction students showcased a wall of switches, and the wiring don’t behind that wall that illuminates the events. From three way light switches, to a breaker box and outlets with USB ports in them, the students designed and built everything. Also on display at this table was a segmented room, to showcase framing, wiring, and finishing work that might be done in a home. The culinary arts students fed the crowd, with choices of dips, stuffed mushrooms, and even a banana pudding for dessert that one taster said was so good, he couldn’t remember when he’d had better. Audio Visual students had a Green Screen display, showing how movies use digital effects to insert actors into movies. The automotive students showcased some of the many parts and tools they use while working on vehicles, while at the same table the welding students walked visitors through how a welding mask protects their eyes and the different kinds of welding and their uses.